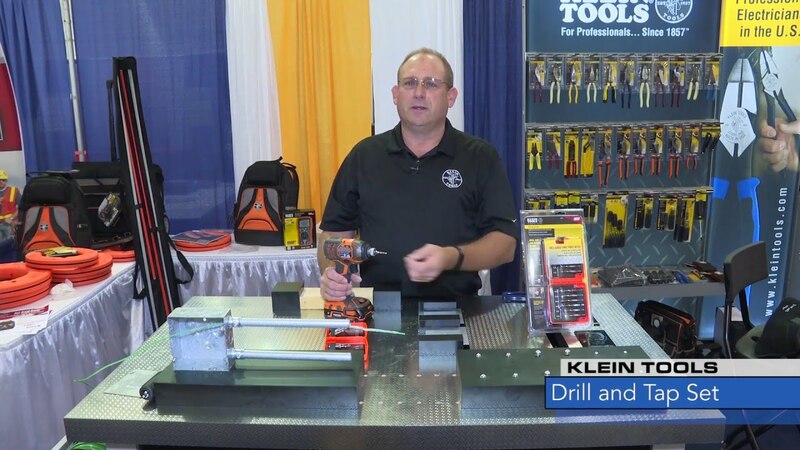 Klein Tools is back to tell us all about their latest and greatest. Save time and energy on the job with the Klein Tools Drill and Tap Set. Ranging from 6-32 to ¼-20, there is a drill and tap for every job. In one swift motion, you can drill, tap, and deburr. Get a Klein Tools Drill and Tap Set for yourself at www.kleintools.com. Hello, my name is Gary Jost with Klein Tools. And I have here our brand new drill and tap set. The drill and tap set comes with 6 drills and tap, they go from 6-32 to ¼-20 and have spares in the 6-32 and 8-32. They all work in both a regular drill and an impact drill. I will demonstrate how this drills right through the plate. That fast and that simple. A benefit of the drill and tap is that you have the drill, tap, and deburr all in one motion. You don’t need to find individual drills and taps, you can pull it out of the case, already marked for you. It’s in, it’s out, it’s drilled and tapped. Get one for yourself at www.kleintools.com!